← Get Set for More Concrete Calculators! Johnny: So, what do you think of the Lady Krusty Mustache Removal System now, Angelique? supposed to bleed like this? I’ve enthused at length about the power of Crockpots to remove paint from old hardware, but some things can’t be readily thrown into a slow cooker. Sometimes the piece is too big. And sometimes I’m too dang lazy! In that last category are door hinges. 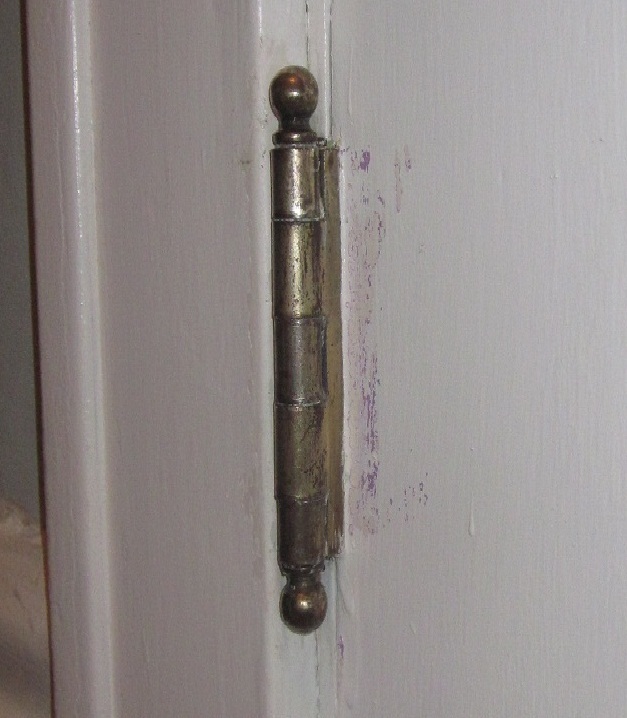 I don’t want to take a door off its hinges, much less take the hinge off the door and the jamb. Those screws are holding just fine, thank you, and I like to avoid too much lifting and fiddling. But once the rest of the door hardware has been stripped and reattached, those hinges start looking pretty gooptacular. I decided to experiment with stripping door hinges in place. I fully expected to be spanked for my laziness, but it actually came out really well. LAZINESS FOR THE WIN! 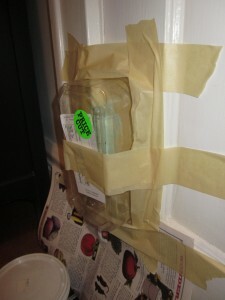 First, I masked the door from the hinge in an excessive fashion. I protected the door and the floor south of the hinge so that any drips would not cause unsightly burns (many layers of paper on top of plastic). Then I applied Zinsser’s Magic Strip. The instructions say to paint it on generously and to wait for 4-24 hours until it turns “light green.” Well, it IS light green to begin with, so thanks for the Mega Clue, Mr. Zinsser. 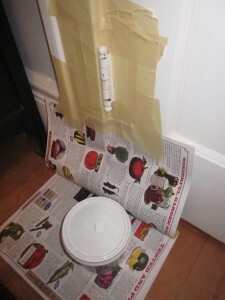 I covered the hinge to deter cat sniffage, and randomly picked eight hours as the trial period. Dohiy.com: Half-assed home improvement ideas, now on clearance! Eight hours later, the stuff was exactly the same color, but an investigatory poke with a scraper brought the paint right off. Holy chemical processes, Batman! After maybe three minutes of scraping and working the hinge over with stripper cleaner on steel wool, the hinge is back! MUCH easier than taking down the door. And then the angels sang. 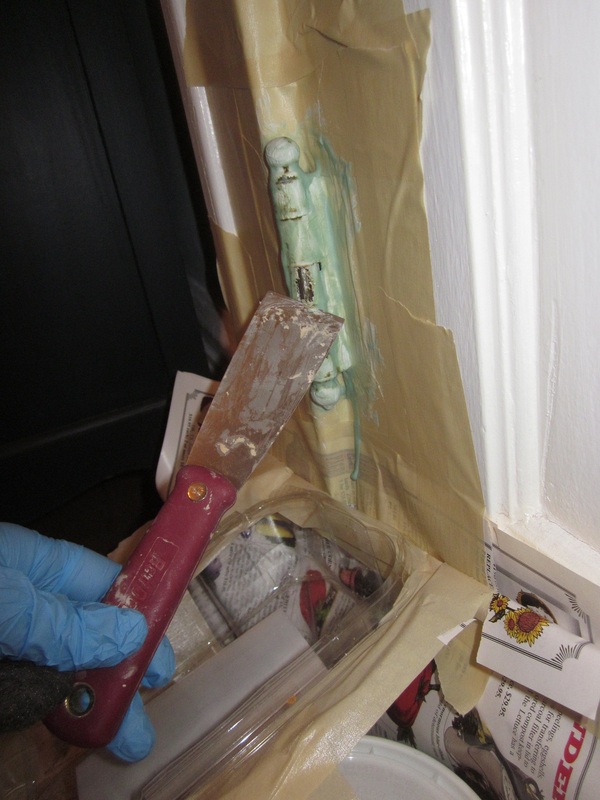 One disclaimer: the stripper seeped under the masking tape on the door side, with the result that it slightly marred the paint surface (see the purple paint peeking through in the last photo). This didn’t bug me too much because I need to touch up the door paint anyway. If you have a perfect surface you want to maintain, you should probably take the hinges off. Next time I do this, I’ll use more serious masking tape, and report back on whether it performs better. Update: See my later attempts at hinge stripping! This entry was posted in Before & After, Repair & Maintenance, Salvage, Windows & Doors and tagged house parts, stripping hardware, vintage hinges. Bookmark the permalink.